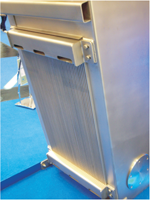 The GVF is a fine bar screen with cleaning rakes for filtration of waste water. 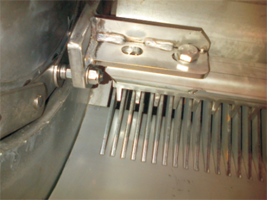 The GVS is a fine screen with perforated screening element having cleaning scraper bars and brushes. Six cleaning rakes included in the standard version. Spacing : GVF from 6 to 10 mm., GVS from 3 to 6 mm. Inclination : 75° or vertical. High screening performances with reduced costs. Installation in channels upto 2 meters wide and 10 meters deep. Municipal waste water treatment plants. Industrial waste water treatment plants such as paper mill, slaughterhouses, food industry, textile industry, tanneries, chemical industry. Channel width : from 400 up to 2000 mm width.